Sensory bins are a great way to introduce your kids to new textures and ideas. It’s an inexpensive and fun way for kids to explore their senses. It is also great pretend fun! Today we are sharing a round-up of some wonderful sensory bins that we have seen on the It’s Playtime link-up. We’re sure you will find lots of new ideas for sensory play. 1. This edible zoo is a lot of fun to play with and also great to eat! 2. Create your own miniature dinosaur world and discuss the sights and sounds a dino experienced. 3. Here’s a patriotic sensory bin to celebrate Independence Day. 4. Imagine what it would be like to live like a dinosaur and check out their foot prints. 5. Make your own x-ray light box with simple things you have at home. 6. 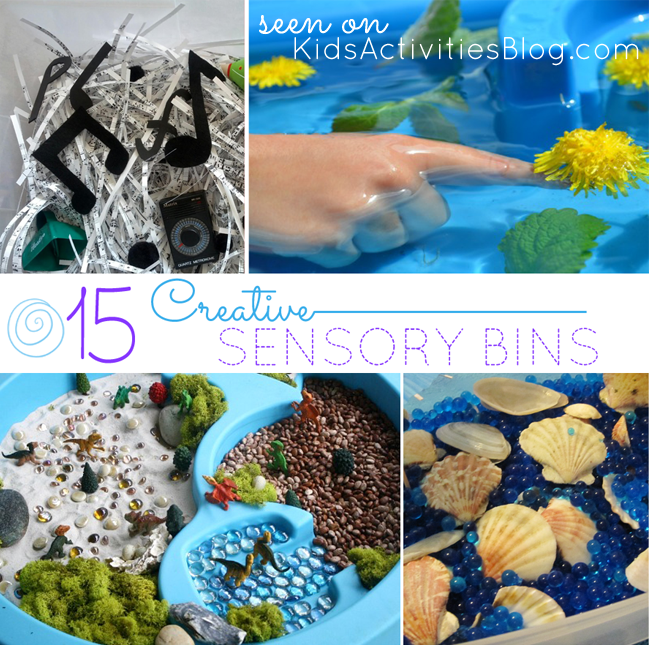 This beach sensory bin would be great to do before your family summer vacation. 7. This sensory bin is perfect for your baby to explore their sense of touch. 8. Make a new sensory bin for every letter to learn more about the alphabet. Here is one for the letter N.
9. Explore your sense of touch and begin to learn about music and sounds. 10. If you have a Tinkerbell fan, your child will love creating a tiny fairy world for her. 11. Another fun medium to try in sensory play is corn silk, which you can make right at home and even color. 12. Let your little one make sounds with a shaker bottle. 13. Make your own frog pond and let your frogs hop around. 14. Bring some extra fun to your spring water table with these fun sensory ideas. 15. Use oatmeal instead of sand for a new and creative way to explore sensory activities. Would you like to share your fun kids activities? Come back at 4pm today to link them up! Thanks for including my music sensory bin! Thank you for including our beach sensory bin. There are some very unique bins in this collection! Thanks so much for including our dinosaur world and edible zoo. Thanks for including our corn silk sensory play ; ) Fab roundup! Thanks for including our Letter N Bin! Lots of great bins in your round up! Thank you for sharing this at After School! I always appreciate seeing your posts there! Sensory play is such a great way to stimulate imagination. Thank you for sharing all of these wonderful resources on this weeks Creative Muster. Now that you found our party I hope that you’ll continue to join us every Tuesday eveining. I love the music sensory bin idea. Thanks for sharing all of these great bins. Thank you so much for linking up to Dare to Share. My son had sensory issues when he was younger, and I know he benefited from playing in sensory bins. You are today’s Dare to Share Feature of the Day! Great list!! Thank you for sharing at Sharing Saturday! Thanks for compiling all these! Such great ideas I know my girl’s will love! Thanks for linkin to Sunday FUNday! I love all of the awesome ideas! Such a great post. Thank you so much for sharing with us at A Bouquet of Talent this week. You were featured at Pick of the Bunch today!